Customizing soccer balls to market to the ever increasing number of soccer fans is a really smart idea today. Soccer has long been the most popular sporting event in the world, with the prestigious World Cup being probably advertisers' favorite events as companies can use this lucrative opportunity to showcase their brand and their message to millions upon millions of crazed soccer fans world wide. For some reason however, soccer has taken a long time to take hold in the United States of America. In the last two World Cup events (which happens once in four years) however, there has been a very noticeable change in Americans' attitudes towards the game of soccer. More and more, you see custom soccer balls being given out as giveaways during the World Cup events to delighted soccer fans. Attendance at sports bars airing the World Cup and at other venues are packed full of patrons cheering wildly as each goal is scored. More and more, as you walk the sidewalks and boulevards along busy streets, you see sandwich boards advertising the airing of the Soccer World Cup to draw customers. Many schools now also serious soccer teams and kids and parents are taking this sport just as seriously nowadays as say American Football. 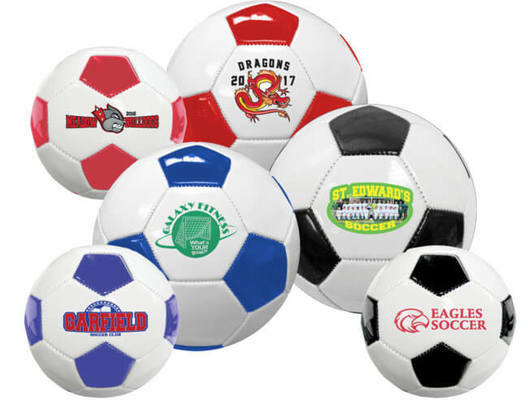 With this information, why not cash in early and bring in prosperity and success for your company by printing your brand name or logo onto some custom soccer balls? Make those avid soccer fans remember you and your brand name! While not currently as popular as football or even basketball just yet, it is definitely the fastest growing sport in America, and may soon be on par or even surpass the later two sports. At Promotion Choice, we carry a full inventory of personalized soccer balls that will fit your needs and perhaps more importantly, your budget! Customized mini vinyl soccer balls are very popular with customers for throwing into large crowds during parades or event at concert events, as they are soft and safe and will not injure anyone. These are also our most economical line of promotional soccer balls and are available in red, white, pink, glow-in-dark, and blue. Then we also have the 2.5 inch soccer foam stress ball and the larger 4 inch and 5 inch custom foam soccer balls that are all soft and budget friendly. Moving on up, we have our soccer balls in synthetic leather, and these are available either as Size 1 (18 inches circumference) or Size 5 (27 inches circumference). Our synthetic leather printed soccer balls each have 32 panels that can be printed on. The main panel however is larger, and is where most people choose to put their logo on. Synthetic leather imprinted soccer balls come in red, blue, and of course, the standard black. Finally, our top of the line custom soccer balls is the premier Wilson synthetic leather soccer balls. These are available only in the classic black. All of our promotional soccer balls can be pad printed with spot ink colors. However, the recent years, we have improved our printing technology, and can now print in full color direct onto the customized foam soccer balls and the mini synthetic leather soccer balls. The large full sized print soccer balls can also be printed in full color, albeit via a heat transfer method that permanently adheres a decal onto the ball – this is done so well, most of the time, you won't event notice its a decal! Get some promotional soccer balls printed today, and you won't regret it! If you are a school soccer coach, putting your team's photo onto the soccer balls makes the most awesome memorabilia! If you are a company, your company logo and/or text message on a soccer ball will not be missed and will be held onto and cherished by those loyal soccer fans!